Little martial artists practice oom yung do. This morning, children throughout the neighborhood will shoulder their backpacks to begin the new school year. But what will they do during those hours between when school gets out and bedtime? Or on the weekend? If you are looking for back-to-school activities for your students, and if you want to avoid the nasty rush hour commute that often accompanies those activities, check out what’s available in the neighborhood. Think of it – supporting local businesses, saving gas, and wearing your kids out all at once! Wallingford Boys & Girls Club has a free afterschool drop-in program for youth in grades K-12. We serve approximately 125 kids and teens per day and offer homework assistance, gym time, small group programs, and a daily snack. Once children purchase a $36 membership to the Club, they can attend the program as much as they would like at no additional charge. We are open on regular school days from 2-7 p.m.
Theater of Possibility (“TOP”) offers an after-school drama workshop with classes for both kids and teens. TOP explores relationship skills through acting, improvisation, collaboration and playwriting. For registration and information, contact [email protected]. (206) 320-0570. CMA offers music lessons and musical adventures for students ages 4-18. Off the Wall offers a free music lesson to every Seattle resident, as well as ongoing lessons in piano, voice, guitar, violin, drums and bass. The LAB is offering a 12 week progressive class for children ages 5-12, starting on Saturday, September 7. 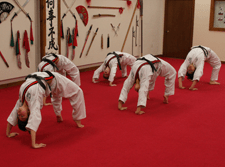 We offer separate classes for kids at the Jae H. Kim Tae Kwon Do Institute. Our kid’s classes build strength, agility, and fitness levels. They also develop character and help with goal setting—not to mention they are FUN! Experienced teachers will lead your child through an hour of learning about tumbling, juggling, balance tricks and more! Followed by 15 minutes of free play, these classes are great for kids who want to focus on becoming awesome at physical skills. Dance Fremont offers a variety of classes for preschoolers through teenagers.